Many people are plagued with a hidden illness that affects their health immensely. They are beginning to find out about it and their life has suddenly changed for the better. We’re talking about Celiac disease: an allergy or intolerance to the grain protein “gluten.” You’ve likely seen many products with a “gluten-free” label on it, but what are the gluten allergy symptoms adults and children will have and the signs gluten allergy could be already be wrecking your health? If you find out that you have celiac disease, you should stop consuming gluten and find alternatives for the good of a tremendous improvement in your health. In turn, the villi will get damaged over time and create a bodily state that is malnourished because it has no way to absorb the proper nutrients. Your bloodstream will lack macro and micronutrients that are required for proper function of your body and feeling good in general. Malnourishment can bring about any combination of symptoms. You’ll need to listen to your body to know if it is in need of something. There are a supposed more than 300 symptoms of celiac disease that can vary for each person. First of all, you need to understand what the symptoms of malnourishment are, the lack of proper nutrients in your cells, because this is the root cause of your health problems in regards to celiac disease. That’s if you have it, of course. Weight loss. If your BMI is under 20, then you may be malnourished. Your body might not be able to absorb calories properly. When this is the case for a long period of time, your fat cells will need to be used for energy. Weakness and fatigue is a major sign that you are malnourished. The muscles in your body will waste away and you might not feel that you have the strength to carry out your normal activities. Anemia may also contribute to the lack of energy throughout the day. When your body is not able to properly absorb iron, this creates a huge problem for your blood health. The blood may be filled with waste product that cannot be excreted through the kidneys or liver. Dry and dull skin and hair. Your skin might be dry and flaky, hair might be dry or lifeless. Physical signs make your health very apparent. In women, menstruation may be excessive or stopped completely. Depression is very common in malnutrition. When adults with celiac disease eat gluten, their body undergoes an immune response that attacks the small intestine. When your body attacks itself, this is called an autoimmune response. Your food will pass right through you, giving you no benefit whatsoever and only stressing your body further by making it digest and process the food. If this condition is left untreated, your health will noticeably decline in many ways. It might be apparent why this happens: your body is trying to function under stress with no nutrients. Iron-deficiency anemia. This is a severe condition in which your red blood cells lack a foundation iron atom. It is required for excretion of waste, transport of oxygen and nutrients, as well as many other processes. Nervous system disorders like seizures, dementia, migraines, neuropathy, myopathy and twitching. Pancreatic stress. This is very serious because the pancreas creates enzymes that digest food and assist immune function. These are just notable and common gluten allergy symptoms adults get. They may be different from the ones that can be noticed in children. 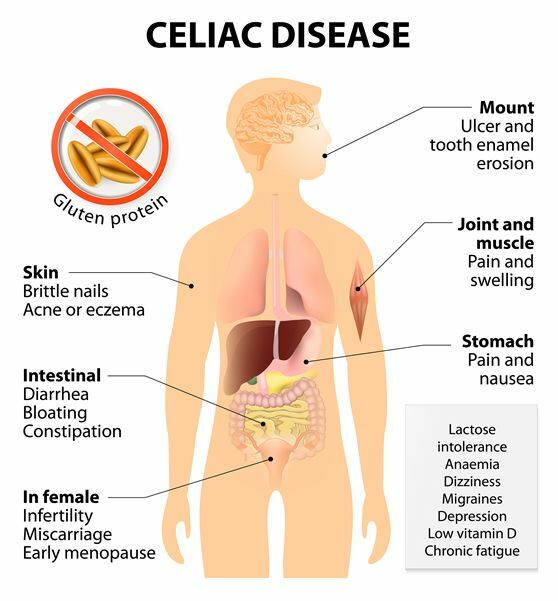 Celiac disease will first form in a person who is genetically predisposed when they are first exposed to gluten in their diet. This will likely be at around 6 months of age when you begin feeding a baby soft, solid foods. A favorite food to give our babies is bread anyways. There is a wide variety of symptoms that your child can show if they are being harmed by gluten. The disease may also affect them slightly or severely in different ways. Symptoms may last a few minutes to a few days after exposure to gluten and they might be very easy to miss. Excessive gas, abdominal pain and constipation may prove that severe damage is being done to a child’s body and you won’t even recognize it because these are normal symptoms for any person to have. Other children may have obvious symptoms like failure to thrive weight loss and throwing up. Fortunately, children are much easier to treat for celiac disease than adults. They typically feel better after a few days of eliminating gluten from their diet. What usually encompasses the gluten allergy symptoms children will have is digestive and growth problems. They may be different for each individual. If you have gluten allergy symptoms, you can easily treat them with natural foods and products that can help you heal your condition. First off, you need to eliminate gluten from your diet if you want this condition to heal. There is NO WAY that you can cure celiac disease while still eating gluten. You will need to find alternatives to wheat, barley and rye. Common sources of gluten are breads, beer, flour, baked goods, pizza, sandwiches, etc. There is likely an allergy-friendly isle in your local supermarket that has gluten-free alternatives to flour and bread that you can use. Some of these alternatives actually taste better in my opinion! If you have accidently consumed some gluten, you should invest in a quality digestive enzymes supplement to take right after. This will help your body digest the gluten before it has time to damage your small intestine. It will also assist your body in many healthy ways. After a few weeks of eliminating gluten, you will feel miles better—guaranteed. The villi in your small intestine will regenerate and you will start absorbing nutrients that you’ve been craving for a long time. After a few months of healthy eating, you may want to eat gluten again. This may be possible if you allow your body to heal the root cause of your celiac disease. In some cases, the disease is genetic in its root cause and you may not be able to healthily eat gluten again. However, a condition of your body may be the cause of gluten allergy symptoms and you may be able to eat gluten in small amounts in the future. 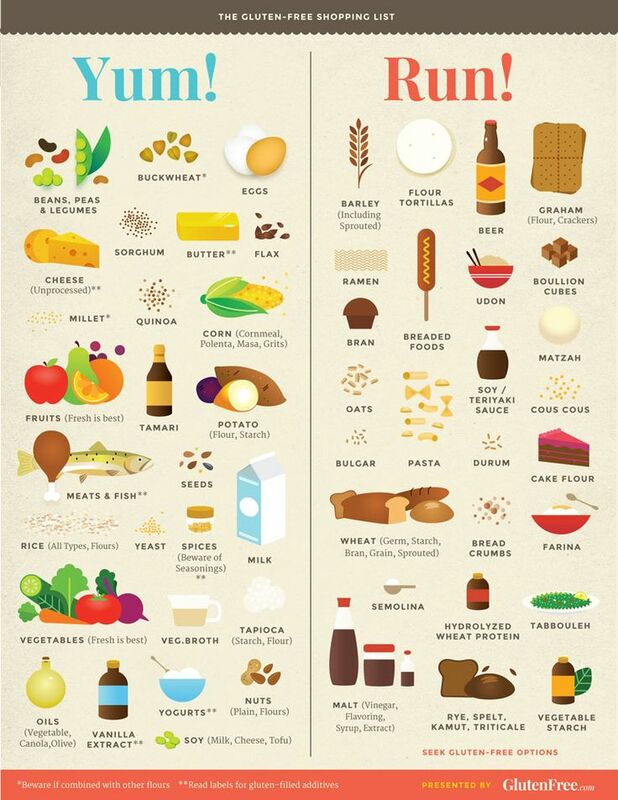 It should be noted that foods that contain gluten are likely unhealthy anyways and should probably be avoided by everyone and replaced with fresh vegetables and easily digested grains. But it’s understandable if you want a slice of pizza every once in a while! I am always here for you, so if you have a question or something to add about gluten allergy symptoms adults and children will get, please leave me a comment below! It’s possible to develop the condition as an adult. Sometimes the celiac gene gets “turned on” by stress, trauma, or other illness. You think a celiac gene gets turned on? I don’t know if that makes any sense, but if you are a person that develops an allergic reaction to a food, it might have to do with your internal biology. It seems that people acquire parasites that give them allergies and they don’t even know it. Celiac disease and gluten allergy seem to subside and go away for some people though, me included. Nutrient deficiencies and leaky gut can cause allergies as well.